Enjoy luxurious accommodations! Resort located right on the beach! Buyer may receive a title fee credit, inquire for details! Situated in the heart of the Mayan Riviera on a pristine, white-sand beach, *Royal Haciendas* offers guests comfortable villas in a spectacular setting. Fully equipped units have spacious balconies complete with whirlpool tubs and ocean views. Swimming pools, tennis courts, a restaurant, convenience store, and travel agency are just some of the on-site amenities. The resort is just five minutes' drive north of Playa del Carmen, 35 minutes south of Cancun's airport, and a short boat ride from Cozumel. The ancient Mayan cities of Tulum and Coba are in the area. 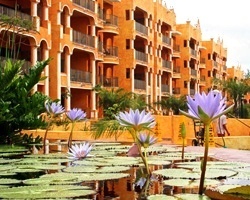 For more information about this beautiful resort or other Royal Resort locations, visit www.royalresorts.com. *RCI Gold Crown Rated / Interval International Premier Resort* Featuring a finely appointed 2 bedroom, 2 bath lockout suite that will accommodate 8 guests comfortably. Usage is annual in week 34. RTU until 2054. For more information or to make an offer, please submit the inquiry form.